Stay away from mediocre miter saw stands. If they cannot stand the weight of the boards and the miter saw, they’ll only make your work harder. Worst yet, they can even ruin your miter saw in case it collapses. Completing a precision cut will also be a hassle. Especially if the miter saw stand does not support and hold the board firmly in place. That said, the good news is, choosing the best miter saw stand that can meet your needs doesn’t need to be hard anymore. In fact, I have taken it upon myself to find the best ones in the market for you so you do not have to. But be prepared to invest a little more money for these stands. The old saying “you get what you pay for” applies perfectly when it comes to miter saw stands. If you’re working on a tight budget, I also considered you. I ensured the products I reviewed had a perfect mix of budget friendliness and high quality. So you won’t need to spend a fortune to get one of these best miter saw stands. 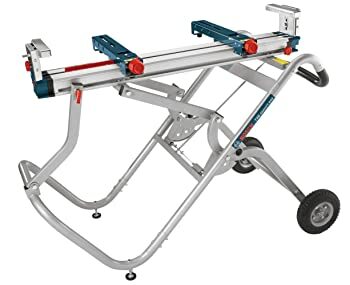 Without further ado, allow me to start by introducing you to what a miter saw stand is. We can define a miter saw stand as a flat base where you can install your miter saw in order to work on your projects. You’ll also fix the boards and planks on this appliance. A miter saw stand is among the most versatile woodworking tools for any hobbyist or professional. Before we take a look at the different types of miter saw stands, I will show you how to use and maintain one. This section of the post is also as important as any other section in this blog post. Because if you do not use your appliance correctly, it could destroy your expensive miter saw or worse, harm you extensively. Most stands that I review here are foldable. They also have four wheels and little buttons where the legs of the stands push in. You can push the button and open up the legs so you can clip them in. The miter saw stands also retail with adjustable slides that will slide out in order to hold longer pieces of woods on both sides. I recommend that you do not use them unless you have to work on longer boards. The smaller the slides are, the better. The slide is also made of metal which is very lightweight. Most stands retail with a mount placed at the middle where you’re supposed to attach your miter saw. The mount comes with little black depressible levers that clip into the stand. It also mounts to the saw and you can clip it underneath using the handles. Basically, you want to ensure the stand is on level ground while you’re using it. You do not want to have it on an angle in any way or one leg sinking into the ground than the other. Doing that could be hazardous. To avoid these mishaps, always ensure you have a steady, solid ground before you start using the miter saw stand. The miter saw is also very heavy. And when you install it, the best thing you should do is close it up, lock it, and tighten up the slide. This ensures the saw does not go forward and backward or up and down. This also makes it easier to mount, easier to use, and a lot safer. I highly recommend that you ensure everything is locked up as required before you mount the saw onto the stand. Once you have everything done, you can get to business. We can place distinct miter saw stands into a variety of different categories at any time. But we will classify the stands according to their features and intended purposes. Which means they retail in four distinct types: folding, rail, roller, and traditional. The traditional type is usually a pair of horses that allows you to place a timber across the sawhorses. This type will come in handy if you have a fixed working space. And also do not need to move the miter saw stand around too much. A roller miter saw stand is the best if you’ll be working on long and heavy pieces of wood. The rail stand features four pull out legs that protrude from the rail they are attached to. If you think you’ll be moving around a lot but still want a solid base you can work with, a rail stand is a perfect product for you. The last, but by no means, the least type is the folding miter saw stand. This type places more emphasis on its portability and versatility. The miter saw stand that best suits your needs and requirements will also depend on your personal preference. But if you still do not know which one you really prefer, I have a trick for you. couple the information I just gave you with the buying guide below and it may set you off on the right foot. All woodworkers are not confined to their workstations. But if you’re intending to work on your miter saw stand from a fixed station, this feature isn’t really important to you. That said, most woodworkers need to travel across states in order to deliver the tasks to their customers. And if you’re this kind of a carpenter, then portability is definitely something you should consider. This second feature only tops off on the previous feature. The ease at which you can store and transport your miter saw stand is essential if you travel a lot. Assembling and dissembling the appliance should also be easy. I assume you won’t have time to waste while on the field. 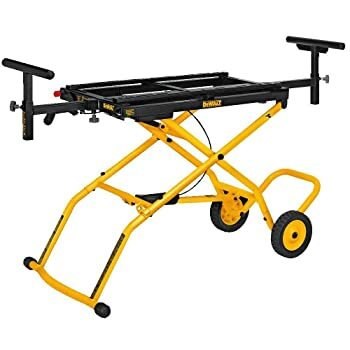 You may need to use the miter saw stand you pick for distinct jobs. This means that the best one should be sufficiently versatile to work on all kinds of saws you come across. This feature is common on most miter saw stands. But most importantly, double check to ensure the appliance you’re about to choose is compatible with your saws. Why invest hundreds of dollars in a product that will breakdown in less than two years? Doesn’t make sense, right? To ensure you get bang for your buck. ensure the saw stand you use is very durable. You can find out this by reading reviews from people who have used the product before you. A miter stand should be a relatively straightforward woodworking appliance. Basically, you just set it up, secure your miter saw on it, and start working on your projects. Some miter saw stands, though, retail with extra features that are not very easy to use. Most of the time they are not even that useful. Is portability one of the most important factors you are looking for? If yes, then this DeWalt DWX726 is the perfect product for you. It retails with saw mounting rails you can quickly adjust. This means that it will adapt to most, if not all miter saws out there in the market place. So versatility is also a check for the DeWalt DWX726. If you move around to different job sites, then you’re also in luck. That is because this appliance weighs only 67 pounds, which won’t be a hustle for two people to carry to the car. It won’t take up a lot of space in your vehicle either. When you fold it, its dimensions are only 17 inches high and 59.5 inches wide. The DeWalt DWX723 is a lightweight aluminum miter saw stand for all miter and chop saws out there in the market. It can hold up to 500 pounds, even though it only weighs 35 pounds. 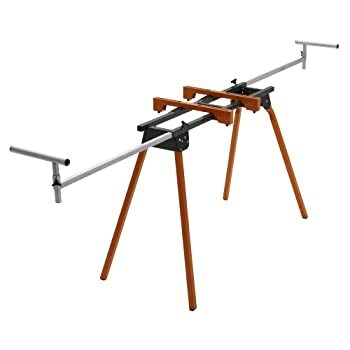 This saw stand boasts saw horse styled legs but no wheels. There are also shielding rubber caps on the bottom of the appliance’s legs. They avoid sliding around while also protecting your floor. The saw stand is 5.5 feet long and 32 inches high. But the support arms at both ends of the stand can extend another 3.5 feet. This awards a fully extended DeWalt DWX723 a total length of 12.5 feet. But it can hold boards of up to 16 feet long. Bora Portamate PM-4000 miter saw stand designed by HTC qualifies as the most budget-friendly miter saw stand in this review. You can probably already comprehend that, given its very basic design. That said, do not let its affordable price tag fool you. It retails with features that you will undoubtedly appreciate. To begin with, this appliance is compatible with every make and model of miter stands in the market place today. Using the quick mount tool attachments that it also retails with, it is extremely easy and quick to attach and detach from the saw. Taking the price tag into account, I have to say that this appliance surpassed my expectations. If you would like to work with a sturdy and top quality miter saw stand, I urge you to give Bosch Portable T4B a try. This stand is adjustable. That’s because it was designed using a patented gravity rise system that ensures quick set up and breakdown. This feature permits you to tackle even the toughest tasks at hand easily. Bosch Portable T4B is also portable so you can easily move with it to different locations. It comes with eight inbuilt pneumatic wheels that aid in transportation. 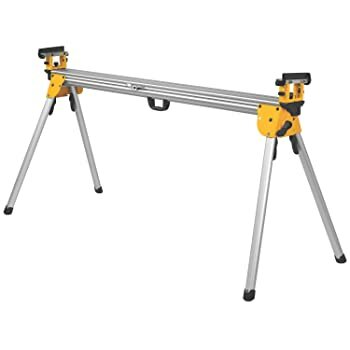 Regarding capacity, the miter saw stand can hold material of up to 18 feet. This is usually the highest capacity in most, if not all portable saw stands. The Toughbuilt 124” Universal Tool is a very versatile saw stand with wheels and saw-horse designed legs. This tool boasts heavy-duty construction and it’s also compatible with almost all types of miter saws. The horse saw-type legs provide sufficient support. The 8.5 inches rubber wheels make it easier for you to move around the miter saw once it is firmly attached to the saw stand. 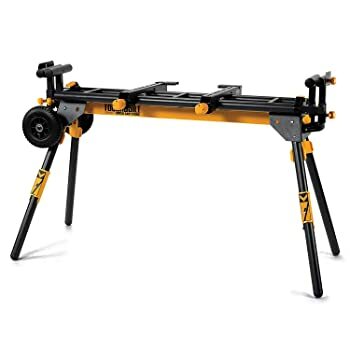 The Toughbuilt 124” Universal Tool stands at a height of around 36 inches and weighs 60.3 pounds. If you’ll be moving to a different working site, simply fold the tool and pack it in your car where it won’t take up too much space. At the end of the day, your work needs, personal preference, and size of the wallet are the determinants. They will decide which miter saw stand you should acquire and which ones you should do away with. Whichever you pick, ensure it’s portable, durable, and compatible with different miter saws. Those are the most important features when it comes to the best miter saw stands.